Discover how one of America's most profitable car companies lost everything, and how it's struggling to fight back. How did one of the world’s most profitable companies hit rock bottom? This film tells the story of General Motors, from its fortuitous beginnings to its sour decline. 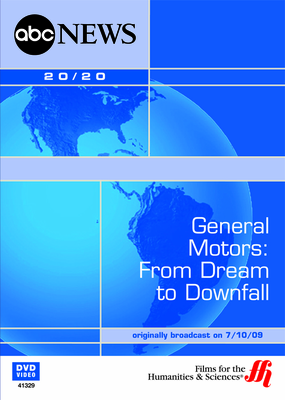 Viewers discover how GM helped to define the automotive industry for over half a century, including contributions to the Space Race and medical technology. GM’s classic designs were once featured in nearly every entertainment media and over 50% of Americans owned a GM vehicle. So how did the country’s most beloved auto manufacturer go bankrupt? Engaging interviews with industry experts, as well as celebrity insiders, showcase the history of mismanagement and foreign competition that drove the company into ruin. Despite numerous changes in management, vehicle design upgrades, and even government bailouts GM continues to struggle in a sluggish economy. What does the future hold for this seemingly doomed company? Viewers may be surprised.